Establishing best practice with your waiting staff early on in their employment with you will save all manner of hassle later on. By setting a precedent, you will not only make it easier for you to deal with issues as they arise, but it will actually make it easier for your waiting staff too, as they will know what is expected of them. Before we get into what is best practice for your waiting staff, do remember your responsibility as an employer too. 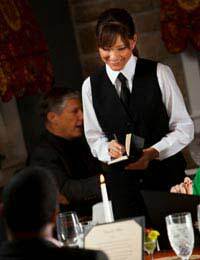 Most waiting staff are either local A’ level students or undergraduates, or people looking to earn a little extra money. Therefore, you simply must pay on time and in full. You will soon lose staff if they cannot trust you to pay them quickly and fairly, including their share of the tips. It’s hard enough running a restaurant without having to chase up errant waiting staff. Let your staff know when they are expected to be at work and how prepared you expect them to be – some restaurants provide uniforms, so do you think they should be in their uniform at the start time, or have five minutes to get ready? Can they have a cup of coffee before they start or only if they arrive early? Get your rules and expectations straight before you tell your staff what is expected, and then be careful to reinforce it. Rota issues are often a cause of great stress for restaurant owners, with waiting staff calling in sick or going off on holiday without arranging adequate cover. It’s at times like these that you have to remember that this is your dream, your business and your responsibility – your waiting staff are there to earn some money. Always try to instil some flexibility between your waiting staff, such as they can take off odd days as long as they have arranged cover, but be fair about holidays by working on a ‘first come, first served’ basis. Good waiting staff need to be able to advise customers on the menu and the wine list. This is a great way to maximise per customer spend, as waiting staff can upsell and help to promote specials. The most fun way to start this process is to have an afternoon with your staff where you have the chef make all the dishes and each taste them. Make sure they can describe the dishes, know the ingredients and can talk about the provenance of the ingredients. Try wines too – especially the house wine and the mid-range bottles on your list and ask a wine expert to talk about what wines go best with what dishes; your wine supplier should be happy to provide this free of charge as it will be good for them too. Good service is imperative. However good your food is, if customers have surly waiting staff, they are very unlikely to return. The first way to establish best practice in terms of waiting staff dealing with customers is to recruit the right people in the first place – you’ll be able to tell if they’re smiley, friendly and positive when you interview them. Secondly, train your staff to be appropriately attentive to your customers and to act in a manner that suits your establishment. Once you have put all these pointers into place, your waiting staff will be a positive extension of your restaurant and will certainly help to gain repeat business. What Benefits Should You Offer Your Waiting Staff?